Back pain is a common complaint. Most people in the United States will experience low back pain at least once during their lives. Back pain is can be caused by many reasons. It can originate from the muscles, nerves, bones, joints or other structures in the spine. 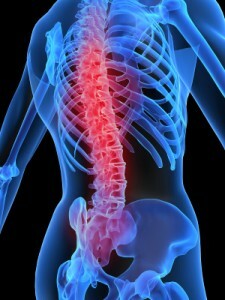 Make an appointment to determine the cause of your back pain. Sedentary jobs, poor posture, obesity, lack of exercise, trauma or repetitive motion can all cause back pain. The pain can be aggravated by long periods of standing or sitting, or by jogging, running, walking, and other forms of activity. Back pain is one of the most common reasons people go to the doctor or miss work. Depending on what is causing the back pain, it may be easily treatable so you can return to your active daily lifestyle as normal. A very effective method of treatment has been found to be A.R.T., Graston therapy, combined with Chiropractic adjustments along with heat and cryotherapy. Active Release Technique® (ART®) has been shown to be very effective in the treatment of back pain. Rather than just addressing just one area, ART® restores unimpeded motion and function to all soft tissues. Graston therapy is a soft tissue technique aimed at breaking up scar tissue and adhesions to promote the rebuilding of scar tissue in the correct line of force to strengthen the muscle, increase flexibility and movement, and promote normal function of the soft tissue. Graston therapy incorporates the use of stainless steel tools that are used to detect and treat scar tissue within muscles, ligaments, tendons, fascia, and all other forms of soft tissue. By breaking up this poorly formed scar tissue and encouraging the body to form healthier and stronger scar tissue. We will also show you exercises and stretches for you to do. These are very important to do because they will help strengthen and stretch the muscles that support the spine and can prevent, reduce and even eliminate lower back pain. Kinesio tape will also be applied over and around muscles in order to assist and give support or to prevent over contraction, affecting change in deeper layers of fascia by manipulating the skin and muscle and creating space underneath the skin. I imagined it was just a herniated disc and compressed nerves which was instigating me pain, but once it wouldn’t get any better after longer than a solar year, my dr begun to be convinced something was up. I guess it was trigger points which were instigating some referred pain in my back but mostly down the leg, akin to the pain of sciatica. Happily, after getting me into a ‘tertiary’ level recovery system, I think I am making a lot of improvement.